NASA has been doing some 3D mapping of the Moon's south pole, an area where we might find hidden water ice. They have made some great 3D animations as a result. There is lots of good science at the NASA site, but the videos are really stunning. I like the lunar south pole flyby myself (above). The full press release is at NASA's exploration pages, the Bad Astronomer has his own musings (and his favourite video), and a nice story with more videos is at New Scientist. Comet Holmes Just Keeps On Going! Comet 17P Holmes may not be the most spectacular of comets, but by golly it just keeps on hanging in there. It is still visible in binoculars in the northern hemisphere, and there are some new fantastic images of it. Here is a great one from David Kodama showing Comet Holmes near the California Nebula. Martin McKenna also has some great recent shots of Comet Holmes (site takes a while to load), including a nice one of satellites going by the comet. Albert van Duin also has some great shots. Carnival of Space 43 is here! Carnival of Space 43 has the curtain drawn back on it at Starts with a Bang! This Oscar-themed outing has solar flares, the end of Ulyssses, 50 years of space science, tracking satellites with Google Earth and much much more. So put on you glad rags and head on over to the red carpet. Jupiter, Venus and Mercury Together. Mercury and Venus were prefect this morning, no peek-a-boo with clouds or anything. The image to the right shows them glowing above the street. Jupiter is top left, Venus is the obviously bright object middle left, Mercury is just to the left of that (you may need to click on the image to enlarge it for Mercury to become obvious). An animation of the planets rising above the street is here (1.6 Mb). Below is a sequence of Venus and Mercury from 26th to 28th February. The images are aligned on the fixed stars. You can see Venus sinking towards the horizon, and Mercury not sinking so fast. It's GLOBE at Night Time Again. GLOBE at night is an international survey to help map light pollution. Everyone can join in, and I urge everyone with a clear sky to have a go at estimating their sky brightness using the charts GLOBE at Night provide. This is also an excellent way to get the kids involved in looking at sky as well. Get out everybody and look up! Venus and Mercury Close, a lovely sight. Mornings are particularlylovely at the moment. High in the sky is Jupiter, and near the horizon are mercury and Venus, close together. I took this image about 6:00 am this morning. Jupiter is up at the top left, Venus is obviously the brightest of the two bright objects down the bottom, Mercury is the dimmer. Venus and Mercury are going to get closer in the next few days, so have a look. Last night was the first time in ages that the sky was actually clear. The seeing wasn't too bad either, there was a modest degree of turbulence, but low enough that I dragged Don the 8" out and set it up. I also managed to hit the sweet spot with polar alignment for a change, and the was very little image drift. So encouraged I went for Saturn. And it was beautiful, I sat (or rather, given the location of the eyepiece, crouched) for ages watching it. Titan was clear and nearby too. 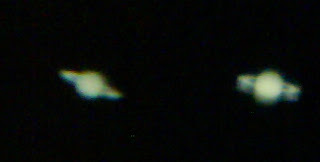 I did a very bad sketch of Saturn, then took these images with my mobile phone. I really need to make a mobile phone holder for my scope. Congratulations cubed - Comet Al's third Secchi comet! Comet Al has done it again, and again! Not content with finding a Kreutz family comet in the STEREO Secchi imager, he's found a second and a third! The third one is a real cracker, as you can see in the animation above, it shoots through the field like a meteor! If the animation is a bit confusing at first, look at the illustration opposite. 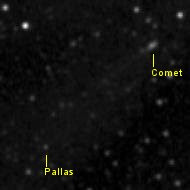 The comet heads bottom left to upper right, staring near the asteroid Pallas. The asteroid 2 Pallas, magnitude 10 at the time these Secchi images were taken (Feb 20th), is down the bottom. Both the animation and the JPG are assembled from aligning and stacking images from the STEREO Secchi H1A camera. And if that is not enough, they have just located a 4th one just above this one. Sheesh! I just can't keep up! So, after several tries we never could make the Meccano Robot work properly. Literally, the wheels kept coming off, no matter what Middle One and I tried. So finally we disassembled the robot, and built the motorcycle. This was much simpler, it only took a week to make (with lots of backing and forthing, checking of parts lists and some reassembly. Hint, photocopy the parts list and always have the parts list next to the instructions, so you can tell which ambiguous-almost-looking-the same-bits are which). So we finally finished it. When activated the wheels moved perfectly, when held in the air. Place it on the ground, after a few desultory moves the wheels disconnected from the drive cogs and the thing stopped moving. I give up, it looks like this bit of Meccano has a major design flaw. El Mucho disappointed. Carnival of Space 42 is here! Carnival of Space number 42 has now materialized in Chris Lintott's Universe. There's Dark Matter galore, strangely familiar extrasolar systems, deep space telescopes, Saturn's Moons, Lunar eclipses from the Moon and much much more. Grab a proatbel wormhole and tunnel over! USA 193 has been hit! The US spy satellite USA 193 has been "successfully" hit by a missile launched by a naval vessel. Various witnesses have seen debris from the satellite re-entering in a spectacular display. In Australia we could have expected to see the satellite this morning. The debris field will apparently keep on roughly the same orbit as the satellite, and it is possible Australian observers could see some re-entering material. See Heavens Above for predictions for your local area. Here's some US Department of Defence images (none of the impact) via Tom. Here's a story about the shoot-down from New Scientist. Congratulations Comet Al! He has discovered his first STEREO comet! In fact, this may be the first comet that has been discovered exclusively in the STEREO Secchi imagers, rather than via SOHO. The faint dot just above the arrow is the comet. It is one of the Kreutz family of sun grazer comets. You can see an animation of the comet here (warning 3Mb file). Off to the bottom left-hand side is also an asteroid, see if you can find it. What the heck is up with Blogger? The "create post" utility is devoid of link and image upload buttons, most I can live without and write raw html myself, but image upload is critical. Save Now doesn't work either. 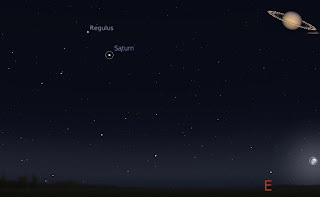 Location of Saturn as seen from looking north-east Adelaide at 10:00 pm ACDST on Sunday February 24. Similar views will be seen at the same equivalent time in the rest of the Southern hemisphere (click to enlarge). Inset: orientation of Saturn's rings. 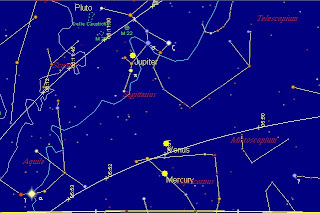 Saturn is at opposition on Sunday 24 February. At this time it is at it's largest and brightest as seen from Earth. This is a perfect time to observe Saturn with a small telescope. If you don't have a scope, try to get to one of your local astronomical societies or public observatories Open Days. Unlike Mars, whose diameter changes rapidly at opposition, Saturn's diameter changes slowly, and will be good viewing for some time. Updating my previous post on seeing the ISS go between Mercury and Venus. Some parts of Australia WILL see the shuttle on the 20th, travelling a bout a minute ahead of the ISS. Check Heavens Above for predictions for your site. Why do Venus Elongations Skip Years? Correspondent and fellow Science Natterer Cynthia Ma has noticed that there were two greatest elongations of Venus in 2007, but none in 2008, and she wondered why that was the case, when Mercury had multiple greatest elongations in each year. A greatest elongation is when an inner planet, either Mercury of Venus, is at its furthest distance from the Sun as seen by us from our vantage point on the Earth. Have a look at the image to your left, diagrammatically showing the orbits of Venus and Earth (not to scale) to see where a greatest elongation occurs with respect to the alignment of Venus and Earth. If you look at the tables below showing the greatest elongations of Venus and Mercury, you will notice something interesting. You will notice that there is a consistent pattern. For Venus, a western elongation occurs approximately 5 months after an eastern elongation, while an eastern elongation occurs approximately 15 months after a western elongation. For Mercury, a western elongation occurs approximately 1.5 months after an eastern elongation, while an eastern elongation occurs approximately 3 months after a western elongation. A quick look at the diagram will show why, the distance a planet has to travel in its orbit from eastern to western elongation is shorter than the distance it takes from western to eastern. Hence you will get a pattern of two elongations close together, then a big gap before the next elongation. But hang on, you astute readers will say, Mercury’s year is only about 3 months long (87.97 Earth days), and Venus’s year is just about 7.4 months long. Why does it take as long as or longer than a year to get from western to eastern elongations? Well, what this diagram can’t show is that Earth is also orbiting the Sun. By the time Venus or Mercury get back to the same position they were at the previous eastern elongation, Earth has moved on a bit, and Venus or Mercury have to catch up. There is an actual mathematical formula that you can use to work this out, and it turns out that Venus takes around 15 months, nearly two Venusian years, to catch up with Earth so that we can see a western elongation (for more details see this Wikipedia site). Try this java applet to see for yourself, it’s actually designed to show asteroidal orbits. However, if you use the sliders to zoom in on Earth and Venus, then use the change time button to type in the time of the 2007 western elongation and press the animate button, you can see how Venus has to catch-up to Earth. If you have access to Celestia, select Sol, and set the system to follow Sol, turn on planetary orbits, orbit the Sun until all the planets are visible and use the time set tool to type in the elongation dates, then run forward. The ISS passes between Mercury and Venus on the morning of 20 February. View to the east as seen from Adelaide at 5:52 am ACDST (click to enlarge). Over the next few days Mercury becomes more prominent in the morning twilight and comes close to Venus, making an attractive morning sight. 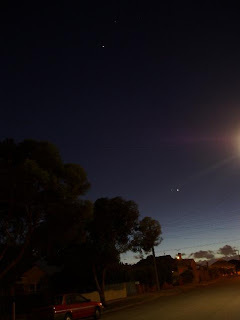 To add to the spectacle, during this time the decaying spy satellite USA 193 and the International Space station pass through the planetary line-up of Venus, Mercury and Jupiter as seen from Australia. From Adelaide for example, on the 20th the ISS passes between Venus and Mercury, and on the 22nd USA 193 passes between Venus and Mercury. These views are highly location dependent, for example, Sydney has no ISS pass on the 20th, but the ISS passes close to Venus on the 21st. This is especially true for USA 193, as it's orbit is decaying. So it is best to get predictions for your exact location from Heavens Above, and check them reasonably often in the case of USA 193. Sadly, Australia wont see the ISS and the shuttle together. UPDATE: on Wednesday the 20th, some Australian sites will see the shuttle and the ISS close together, check Heavens Above for details. 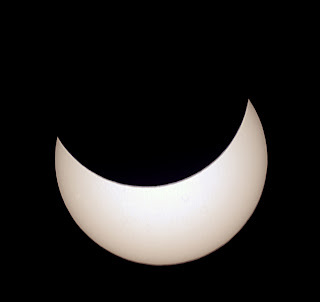 Here are some excellent images of the recent partial eclipse of the Sun on 7 February from Tony Travaglia of Oamaru New Zealand. 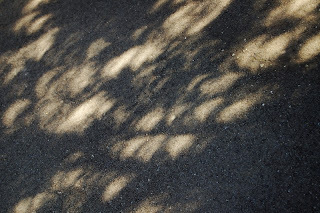 The crescent-shaped leaf shadows are particularly good. Naturally the images are copyright to Tony, so do the right thing, okay? Carnival of Space 41 is here! The Carnival of Space number 41 is now up at New Frontiers. There are galaxy eating monsters, magnetic catapults, the colours of Hubble and much, much more. Grab your jet pack and zoom on over! Image credit John Pane via Astronomy Picture of the Day. 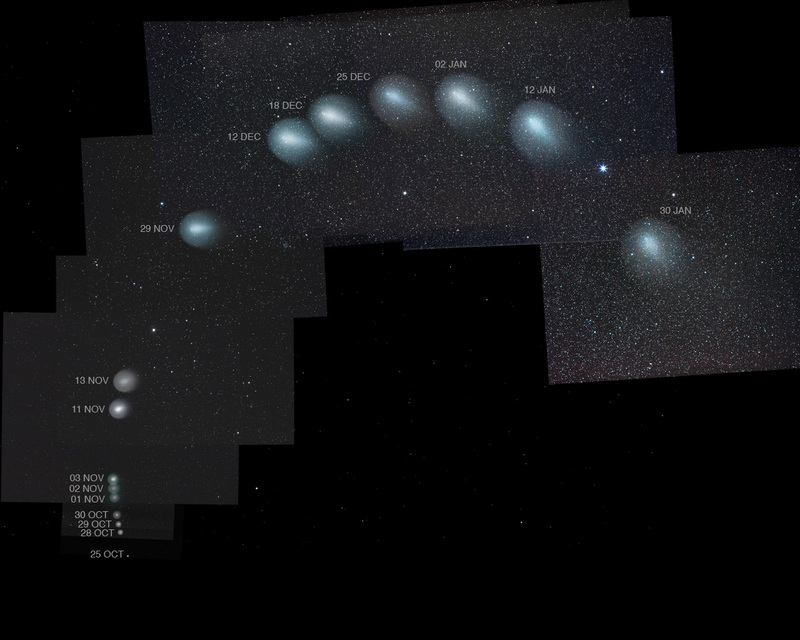 This incredible image from John Pane shows the evolution of Comet 17P Holmes for over 3 months after its outburst. Amazingly, as little as two days ago Holmes could still be (just) seen with the unaided eye in the northern hemisphere. This is astounding persistence. Comet McNaught was the most spectacular comet for ages, but Comet Holes takes the cake for endurance. Here's a fantastic image from Dave Kodama showing comet Holmes near the California Nebula. 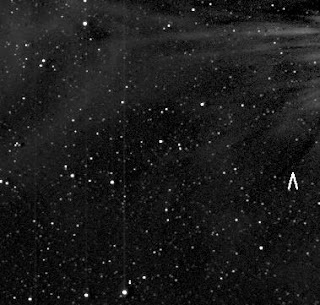 We should be in for some more great images of this comet. Darwin Day on the 12th, the Apology to the Stolen Generations on the 13th. I did buy a rose for the Bettdeckererschnappender weisle on Buy Hallmark Cards day on the 14th. The medication for my ear complaint says "may cause drowsiness". Sure does. Haven't unshipped the scope for a while either, and Saturn is getting close to opposition. Maybe this weekend? Nah, it's Mercury. I'll put up the real comet images later. Hat tip to Comet Al (again). Just a nice Crescent Moon (click to enlarge). I was going to make an animation, but I ran out of space on the digital camera (can you believe that?). Have to take fewer ship photos. We've all been a bit under the weather here at Chez Reynella. The bacteria in my middle ear seem to be beating off the amoxyllin, the Betdeckererschnappenderweisle has been laid low with a cold, and this morning I had to take Smallest one to the doctors after his bronchitis played up again. It would be easy to feel despondent about all of this, until you reflect that there are lots of people worse off. For example, kids with cancer. So we went out to the Flotilla for Kids, a fundraiser for Camp Quality, an organisation brining fun into the lives of kids with cancer. An enormous flotilla of gaily decorated ships, yachts, row boats and even the Dragonboat sailed up the Port River and into the turning harbour, then paraded for all to see. I liked the yacht done up as a Viking long ship myself. In the picture the big ship going through the opened Birkenhead Bridge is the One And All. In the background you can see the new road and rail bridges over the Port River opened for the very first time. One of our neighbours is an engineer on the opening bridges, and he has been working overtime to make sure everything went okay. I'm always a suckker for ships of any description, and I had a marvellous time. Last year $50,000 was raised by the flotilla, here's hoping that they do at least as well this year. Over at SpaceWeather they have a great line up of pictures from the partial eclipse of February 7. Here's some shots from Antarctica, some great NZ ones (love the Tin Man with eclipse eyes) and a few more NZ images. Also some more IceInSpace images here, and here. Carnival of Space 40 is here! Carnival of Space number 40 is now up at the Orbiting Frog. There's thoughts on coming home, images of Comet Holmes, musings on asteroid 2007 TU24 and a whole lot more. Hop on over now. So, How was your eclipse? Mine started off cloudy and rainy. I had bought my binocular projection setup on the off chance that the cloud might part. Come 2:30 there was sufficient holes in the cloud that I thought it might be worth a try. I set up my binoculars and sun shield. Unfortunately I had left the connector for the screen at home, but I improvised with LOTS of masking tape (tape, it's the universal engineering tool). The Sun was being unveiled occasionally, and I could see a definite chip in the side with the heavy duty solar specs. The downside was that when the sun came out of a hole, I would quickly line up the binoculars, then it would go under cloud again, and by the time it came out the Sun had of course moved, and I had to realign everything again. In the course of doing this this the setup came apart in a catastrophic but ultimately comic manner (masking tape does have its limits). I hastily reassembled everything, except the projection screen, which I had had to jam up against the tripod with my hand, while trying to take a photo with my other hand. This is the best shot, you can just see (if you are imaginative) the chip that represent 3% of the Suns surface being covered by the Moon (under the arrow). Then the clouds came in again. What's with all the black dots? I used speckled card to give the automatic focuser something to focus on, previous projection shots haven't worked too well as there was no obvious object to focus on. However, when you are crouching down holding a piece of card in one hand, a camera in the other and trying to stay still, it just doesn't work. At least I amused the passing construction workers. Sydney had lots of cloud and rain but some people got to see the eclipse. Here's some shots from NSW, QLD, and some great ones from Wellington NZ. See IceInSpace for more. Daniel Fischer mentioned in a comment on my previous post that there was an expedition in Antarctica looking at the eclipse, I wonder if we will see anything from them? Just a reminder that on Thursday Feb 7 there is a partial solar eclipse. In Australia it occurs at roughly around 1:30 pm. It is best seen in the eastern states (QLD, NSW, VIC, TAS), and only about 20-30% of the Sun is covered, central states see a measly 5% coverage and WA sees nothing. In New Zealand, roughly 60% of the Sun is covered and the eclipse occurs at occurs at roughly 3:30 pm (UPDATE, Paul Moss tells me that NZ is on daylight savings time, so that makes it about 4:30 pm, all the NZ times in the linked tables are not adjusted for daylight saving time). The eclipse is actually an annular eclipse, where the Moon just fails to cover the Sun, but you have to be near Antarctica to see it. NEVER look at the Sun with unprotected eyes, as severe eye damage or blindness may occur, use safe solar projection techniques (such as pinholes in cards) instead. Another beautiful lineup this morning. After a absolutely clear night, this morning was cloudy too. Still, Venus, Jupiter and the Moon shone through the cloud. In the image, the Moon is over exposed as I've stacked three images to bring out Jupiter. Next on the agenda, the partial eclipse on the 7th. (The Amoxillin is doing a good job fighting the bacteria in my Eustachian tubes, but I think I will not get up early over the next few days). Staggered out of bed this morning to find the sky clouded over. A bit disappointed, I wandered back inside for a drink, then wandered back out to see a hole in the cloud had revealed the Moon, Jupiter and Venus. Somewhat hazily, but revealed they were nonetheless. I luxuriated in their beauty for a while, then fired off some quick shots. They don't work too well because of the could, but the actual sight was very lovely indeed. Tomorrow morning The Moon is below the line up. Well worth getting up for (even if you have an annoying ear infection like I presently do). Venus and Jupiter glow together under the "teapot" of Sagittarius in the morning sky (click image to enlarge it). Tomorrow they are closer still, and are joined by an occultation of Antares. Then on the 4th and 5th The Moon joins the lineup. Happy morning watching! (It's much easier when a small child acts as a defacto alarm clock though). Carnival of Space number 39 is here at Visual Astronomy. There is tales of Asteroid 2007 TU24, spacecraft developments, power for space elevators, assembly in space, Mercury Flyby poetry and much nuch more. Pop on over for a look.